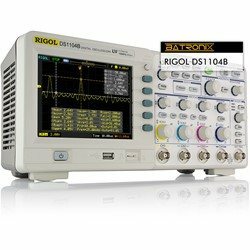 DS1000B Rigol Oscilloscopes ! !Special Offers!! 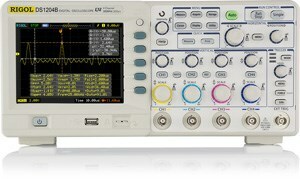 The Rigol DS1000B Oscilloscopes provide 4 channels with a medium-range bandwidth and sample rate. If 4 channels are required, this series is a suitable alternative to the (lower priced) DS1000Z and the higher priced DS4000 series. All models are equipped with 4 channels, a sample rate of 2 GSa/s, a storage of 15 kpts and a 5,7” (14,4 cm) TFT color display, as well as basic measurement and mathematical functions. You can choose between 3 ranges of bandwidth: 70, 100 and 200 MHz. High quality 4 channel DSO with 60 MHz bandwidth and 2 GSa/s. 4 probes, USB cable, pc software, power adapter and manual. High quality 4 channel DSO with 70 MHz bandwidth and 2 GSa/s. High quality 4 channel DSO with 100 MHz bandwidth and 2 GSa/s. High quality 4 channel DSO with 200 MHz bandwidth and 2 GSa/s.